In 9th pAsuram, AzhwAr explains that sarvEsvaran incarnates into this world (which is part of his wealth) for the pleasure of his devotees. Subsequently, AzhwAr says that while brahmA, rudhran, etc., become established due to their dependence on emperumAn, he descends into this world like a common man and make them bewildered by his actions. 9th pAsuram – In previous pAsuram(s), AzhwAr explained inferior nature of brahmA, rudhran, etc., and supremacy of sarvEsvaran (srIman nArAyaNan). In this pAsuram, he explains that brahmA, rudhran, etc., depend on sarvEsvaran and become successful in their tasks. Similar to periyavAchchAn piLLai‘s introduction. Though srIman nArAyaNan is the cause for brahmA, rudhran, etc., he appears in this world where even those dhEvathAs will not step in. The reason for this is explained by himself as in bhagavath gIthA 4.8 “parithrANAya sAdhUnAm…” (to protect my devotees, to annihilate the miscreants and to establish dharmam, I take birth again and again). He appears mainly to cultivate the devotion of his devotees and to create devotion in others and destroying the miscreants is just a side effect. [In arumpatham, its explained further – This is based on emperumAnAr‘s explanation in gIthA bhAshyam for this slOkam where he says “Anushangikasthu dhushkruthAm vinAsa:” (destroying of miscreants is secondary, that which follows the primary aspect)]. brahmA who has the greatness of being the controller of 14 layers of this universe is given a place in sarvEsvaran‘s broad naval along with his universe. rudhran who is the destroyer of the three towns is given a place in the right side of sarvEsvaran‘s body. Even after giving space to such dhEvathAs who at times consider themselves to be supreme, he also descends into this world which is his own property even though he is not bound by any karmA (to take birth). When we try to explain these qualities, we realize that there still lot more qualities of him that are hidden. Such is his nature that he makes everyone become bewildered. vayiRRuLa can also be considered as keeping everything inside his stomach during praLayam. thunthi is the thamizh word for nAbhi (naval). Similar to vAdhi kEsari azhagiya maNavALa jIyar‘s translation. Why is it difficult to understand and surrender to him then? Those who are not friendly to him cannot understand his nature. emperumAn keeps them shackled in this samsAram due to them having no interest in him. valaththanan thiripuram eriththavan – AzhwAr is elaborating the points explained in pAsuram 6 and pAsuram 7 here in this pAsuram. Being proud after destroying the 3 towns, rudhran realizes his true nature after becoming part in the right side of srIman nArAyaNan‘s body as mentioned in mOksha dharmam 167.51 “pasyaikAdhasa mE rudhrAn dhakshiNam pArsvamAsrithAn” (See the 11 rudhras who are situated in my right side). idampeRath thunthiththalaththu ezhuthisaimukan padaiththa nallulagamum thAnum – having the great brahmA in the vast naval as explained in gIthA 11.15 “brahmANamIsam kamalAsanastham” (rudhran who is under the control of brahmA who is sitting in a lotus flower). These are samples of emperumAn protecting them in all manner. ezhuchchi means having the capability to control the universe containing 14 layers . nallulagam – good world – since emperumAn himself descends here. As explained in thiruvAimozhi 4.8.1 “ERALum iRaiyOnum thisaimukanum thirumagaLum kURALum thaniyudamban” (emperumAn gives different parts of his body to rudhran – one who rides the bull, brahmA – who has 4 faces, srI mahAlakshmi, etc). Instead of giving the same place, i.e., his private quarters (srI mahAlakshmi‘s residence) to every one, he allocates different places to each person. His divine form is the abode of everyone. Are these dhEvathAs (brahmA, rudhran, etc) present in the specific parts of the body of emperumAn all the time (like srI mahAlakshmi always staying in his chest)? When there is a danger, emperumAn gives his body as a safe-haven to these dhEvathAs. Since this is a great quality of emperumAn, AzhwArs enjoy this quality always in him (as if they are there always). Small-town kings, ministers, etc., may have their own palaces, etc., but will always like to be honored in the emperor’s palace. Similarly, these dhEvathAs like their place in emperumAn‘s divine body. Like when there is floods/danger in srIrangam, everyone would move inside the adaiyavaLainthAn (7th prAkAram which is like a fort) and when the floods drain (or the dangers disappear) they will return back to their location, these dhEvathAs would reside in emperumAn‘s divine body some times and other times they will be back in their places. thannulagaththil agaththanan – The one who has given place for brahmA, rudhran, etc in his body, will descend into this world, where even they dont want to step in. pulappada – to be seen by his dear devotees as explained in thiruvAimozhi 8.5.2 “kANavArAyay enRenRu kaNNum vAyum thuvarnthu” (my eyes/mouth are dried up craving to see you). For such persons he cannot show his vision by just his sankalpam, he has to be physically present in front of them to satisfy their desires. This is explained in thiruvAimozhi 3.1.9 “mazhungAtha gyAnamE padaiyAga malarulagil thozhumbAyArkkaLiththAl un sudarchchOdhi maRaiyum” (if you just present your divine vision in their mind and not physically be present in front of such devotees, your radiance will decrease). solappugil ivai pinnum vayiRRuLa – He is so great that he becomes the child of dhasaratha, nandhagOpa, etc., who were created by brahmA. Not only that, when dhasaratha said “I am giving you my kingdom” and later said “no kingdom, you have to go to the forest”, he accepted that. 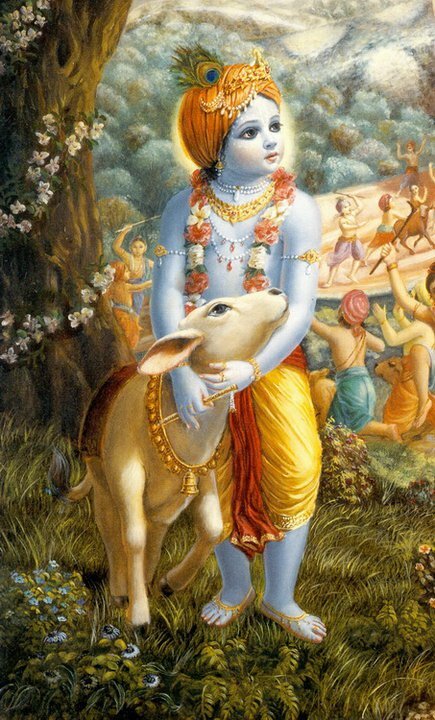 Similarly when nandhagOpa gave him a stick and said “go herd the cattle”, he happily accepted that too. Such are his unfathomable qualities. It can also be said as “him protecting everyone during praLayam by keeping everyone inside his stomach/body”. ivai avan thuyakkE – As explained in gIthA 7.14 “mama mAyA dhurathyayA” (my material world is difficult to cross over) – for those who are unfortunate, he does not allow them close to him and when they try to move away from him, he lets them do that. Since he is indifferent towards you, you cannot understand his glories. This entry was posted in thiruvAimozhi, thiruvAimozhi 1st centum on July 6, 2015 by Sarathy Thothathri.